A recent news report on the colored Slanty chips has resulted in a case of “mistaken identity” between the brand “Slanty” chips produced by Kolson Foods and the unregulated and cheap imitations of it sold in the market. In a press release, Lotte Kolson sought to clarify that it stands behind the Punjab Food Authority’s (PFA) commitment to combat unhealthy and unregulated snacks. Lotte Kolson is a licensed manufacturer of food products by the Punjab Food Authority (PFA). The company abides by the rules & regulations of the authority. Kolson Slanty is a favorite among children across Pakistan, and the company claims that it is prepared under a clean and hygienic environment. 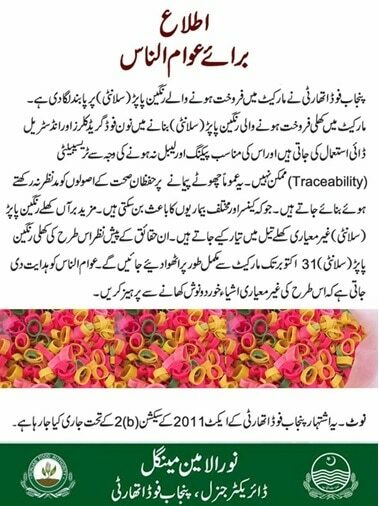 With reference to the published notice by Punjab Food Authority (PFA) above, the general public is advised about the clarification of Kolson Slanty vs colored snacks (paapar).